DENSO has announced that it has developed a 24GHz submillimetre-wave rear and side radar sensor to help enhance vehicle safety systems. The sensor is used in the 2018 Toyota Camry released this past July. It's strategically built into the rear bumper of the vehicle to detect other vehicles likely to enter the driver's blind spot to the rear and side, as well as vehicles approaching from the rear on the left and right when reversing. The sensor is part of a larger system that helps drivers identify and navigate around other vehicles when changing lanes or reversing out of a parking space, and controls the autonomous emergency braking function to avoid imminent collisions. 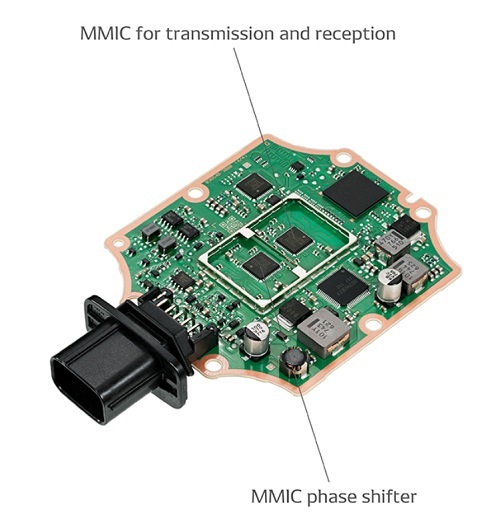 To enable accurate detection whether moving forward or reversing, a phase shifter switches the sensing direction and range of the submillimetre-wave radar sensor. Radio wave transmission and receiving, and phase shifter functions also run through separate Integrated Circuits (ICs) to reduce the size of the sensor. In 2003, DENSO became the world's first company to develop and commercialise an electronically scanning in-vehicle millimetre-wave radar sensor, which utilised digital beamforming. By advancing these technologies DENSO continues to deliver on its mission to build a safe and secure automotive society for all.